Global economic events can have a significant impact on the markets. What you hear in the news may not tell you everything you need to know. There may be other indicators that may tell a better story. Traders need to look for these set of market indicators. Hindsight is 20/20. Yet, to anticipate the unforeseen is another story. If you look at past recessions, you may note that each one had a different major trigger. In 1929 it was a combination of easy margin debt, rapidly rising stock prices, the specter of a global trade war, and rising interest rates. In 2000, it was a boom in internet and technology stocks, driven by falling rates and record-high stock valuations preceding the peak in March. In 2007–08, a housing boom fueled by a subprime bubble and “ninja” loans (no income, no job, no assets) triggered a meltdown in new-home prices. All this eventually exposed the vulnerable underbelly of the market, and we all know what came next—the rest of the stock market followed. Whenever there’s a downturn, investors become fixated on what caused the stock reckoning. So, in the next downturn, they tend to focus on the wrong villain. And although each correction is accompanied by the usual suspects, the primary catalyst is often different. With this in mind, let’s consider some current usual suspects that could get the market into trouble. You may have heard of Warren Buffett’s indicator, market cap to gross national product (GNP), which suggests whether the stock market is undervalued or overvalued. The indicator has been refined to use the gross domestic product (GDP) instead of GNP. To see how well it’s worked in assessing valuations, fire up your thinkorswim® platform from TD Ameritrade and pull up the chart of “Stock Market Capitalization to GDP for United States” (see the sidebar, “How to View Economic Data”), which is similar to what you see in Figure 1. Display the recessions (gray vertical bars). If you focus on the 2000 and 2008 recessionary periods, you’ll see the value of the stock market cap to GDP ratios before the recessions (vertical dashed lines). FIGURE 1: STOCK MARKET CAP TO GDP. The gray vertical bars show recessionary periods. The markets peaked (yellow dashed lines) in Q1 2000 and Q2 2007. Subsequent lows occurred in Q3 2002 and Q1 2009. Source: thinkorswim from TD Ameritrade. For illustrative purposes only. In hindsight, it’s easy to see when values were at medium- to long-term extremes. The ratio hit a peak in Q1 2000 just as the Nasdaq and S&P 500 indices were peaking. In Q2 2007, values peaked at a lower level as stock markets began to roll over. The challenge lies in figuring out when the next market value threshold has been reached—in advance. The data on the chart goes up to Q3 2017. At that time, the ratio was higher than it was before the 2000 dot-com crash. Debt can be a challenge, both in our personal lives and in the market. Debt exists at all times, but the devil is in the identification of how much debt triggers a stock price correction. Consider Figure 2. If you look at the same two recessionary periods as in Figure 1, in 2000, debt was continuing to rise even as the stock market was falling month over month. Although debt relative to the economy took a one-quarter breather, it resumed its climb. At that time, debt seemed like a problem, but that level paled in comparison to the next peak in Q1 and Q2 2009. And although the peaks in total credit market debt and stock market capitalization peaked around the same time, the peak in debt/GDP came 24 months later than market cap/GDP. FIGURE 2: ALL SECTORS; DEBT SECURITIES AND LOANS; LIABILITY, LEVEL. Relative to GDP, total debt hit a modest peak of 2.13 times GDP in Q1 2000 before taking a one-quarter break to resume its upward march. The next peak of 3.61 came in Q1 and Q2 2009, before relative debt levels dropped for the next five quarters. Then the ratio turned up again. Source: thinkorswim from TD Ameritrade. For illustrative purposes only. Yet 2009 was different. Interest rates dropped to record lows in 2008–09, and have stayed there for nearly a decade. This suggests the stock market and the economy are more vulnerable to pressure as interest rates rise. A jump of 100 basis points when rates are 10% is much more manageable than a 100-basis-point rise when rates are 2%. And speaking of rates, another indicator to check periodically is the yield curve (the difference between short- and long-term bond-yield rates). A flattening yield curve (short-term rates rise and long-term rates fall) can be a sign of growing headwinds in bond markets. The yield curve was flattening into the end of October 2018. In March 2000 the Shiller cyclically adjusted price-earnings (CAPE) ratio showed that stock values were overvalued (Figure 3). Unlike most price-earnings measures that use a 12-month look-back period, Shiller’s CAPE looks back 10 years. FIGURE 3: PRICE-EARNINGS RATIO VERSUS INTEREST RATES. 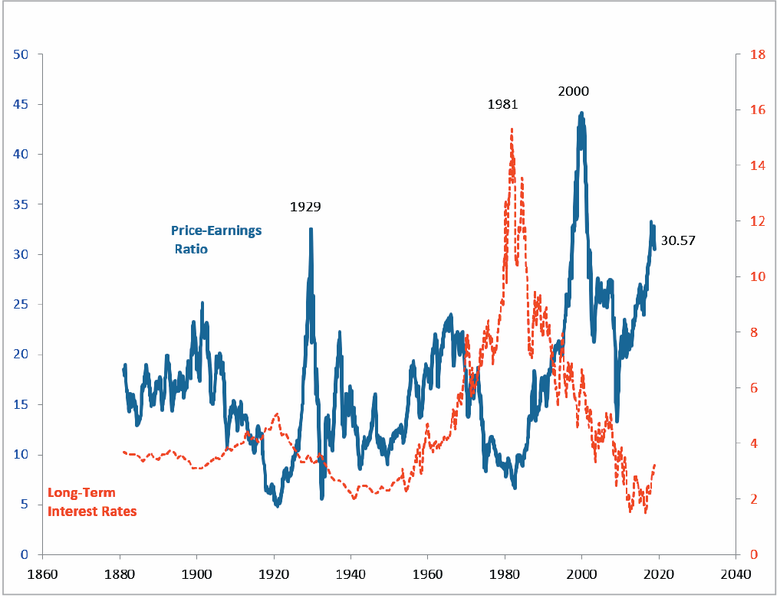 1929 and 2000 saw price-earnings ratios peak, but interest rates were relatively low. Data source: Robert Shiller. * For illustrative purposes only. Although it would take another 39 months for that concern to be fully realized, there had been a number of other warning signs, including the Asian financial crisis in 1997 and the collapse in the Russian ruble in 1998. As Figure 3 shows, CAPE values as of Q3 2018 at 30.57 are still shy of the 44.2 high in Q4 1999. However, it’s interesting to note that CAPE peaked at a relatively benign 25.96 in Q4 2007, compared to 2000. Keep an eye on intermarket forces. Both the Asian and Russian crises can trace their roots to high debt levels. When these cracks began to appear, they impacted markets at home and around the world. You may have heard of intermarket analysis, which studies the interplay between stock, bond, commodity, and currency markets. The 1997 and 1998 crises are another example of how collapses in one market and region can affect the global economy. These events eventually impacted U.S. stock markets. That situation can draw parallels with the present. By the end of October 2018, emerging markets were trending down, relative to the S&P 500 Index. Escalating trade tariffs and rising geopolitical risks haven’t helped ease tensions. Another concern is that according to the Philadelphia Housing Sector Index (HGX), new housing and housing-finance stocks dropped more than 30% between January and the end of October 2018. By no means are we here to predict what the markets will do next. 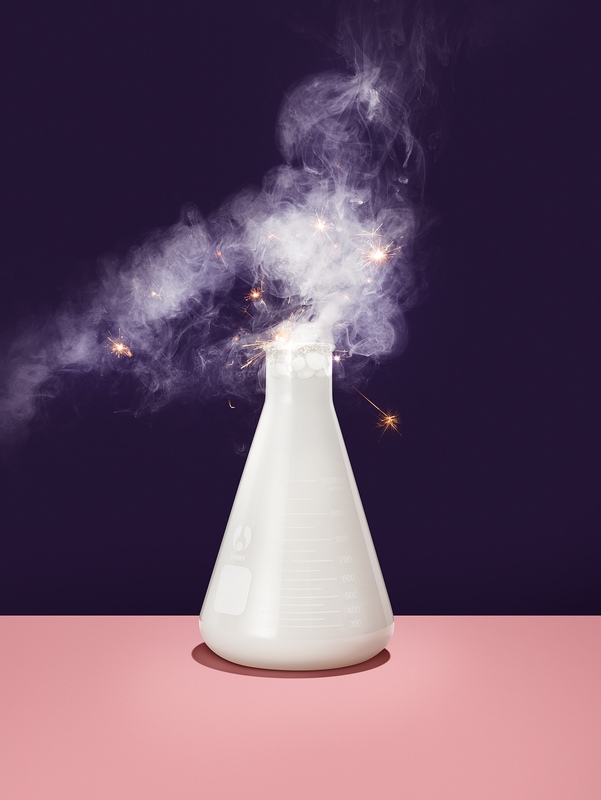 But when economic expansions run long in the tooth, as well as bull runs in stock markets, it’s worth keeping an eye out for warning signs that might fall under the radar for most investors. So, if you suspect a correction is in the offing, depending on where market volatility is at any given time, there are a lot of things you can do to prepare. Suffice it to say, every major bear market, and subsequent recession, has a supporting cast of usual suspects. Although similarities exist, each was triggered uniquely by a major catalyst that was different from the prior meltdown. There is often no single warning sign that another meltdown is on the way, or what will cause it. Matt Blackman is not a representative of TD Ameritrade, Inc. The material, views, and opinions expressed in this article are solely those of the author and may not be reflective of those held by TD Ameritrade, Inc.
*Source for Figure 3: Spreadsheet available for download here.